I may or may not have gotten ridiculously excited, to the point of almost wanting to jump up and down (don't judge me), when I made this dip. Do I say this every week for SPD? Possibly. You have probably seen this recipe on Pinterest (which was my pinspiration), but it has a deeper meaning for me because it is very similar to a dip my Mom used to make me growing up. By that I mean she made it almost every single day when I came home from school, and she made it when we would travel for my soccer tournaments on the weekends. My soccer teammates would specifically request it from her because it was that good! This one is much, much healthier than hers that had cream cheese in it (I think), but this recipe doesn't lose that yummy taste that I remember! 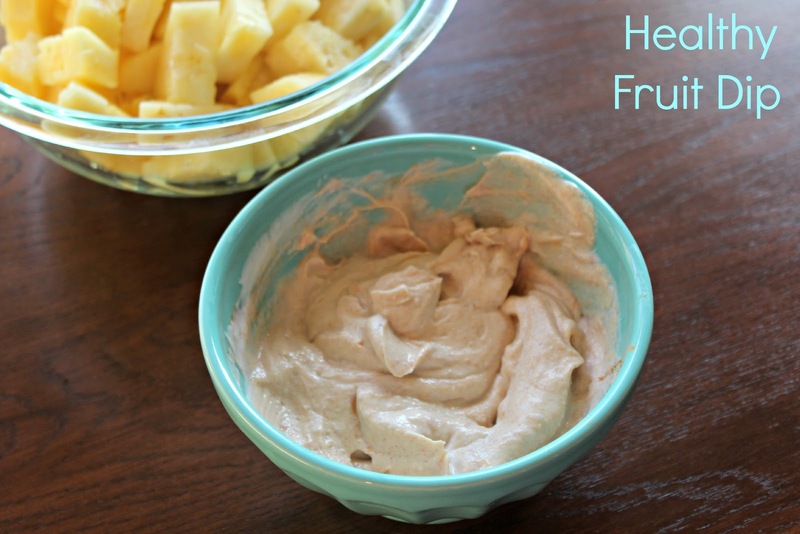 This will be your new favorite dip for the spring and summer. Well, it will definitely be mine, but I hope yours too so that we can bond and talk about how much we love it on a weekly basis. Mix 5.3 ounces of vanilla Greek yogurt, 2 tablespoons peanut butter, 1 tablespoon honey, and a dash of cinnamon in a bowl. Serve with your favorite fresh fruit! I like to add more than just a dash of cinnamon, but that's just me. I kind of eyeball all the ingredients and taste it here and there to adapt it to what we like. That just means more dip in the mouth which means more happiness in my book. If you make this and decide that it's going to be your new favorite dip, let me know so we can chat about how yummy it is with pineapple, or whatever fruit you serve it. We are HUGE pineapple fans over here. Also, soon for SPD I will be reviewing Jillian Michael's 7 Day Drink Detox. I'm on Day 2 right now. If anyone is wondering-you still eat on this detox which is why I chose it! Stay tuned for the results on that. Hoping it's good results since this time next week I will be in NASHVILLE! Alright-your turn! What did you make from Pinterest this week? Hey Girl! Happy SPD day! hehe That dip looks awesome. I can not wait to try making it myself this weekend. yum! 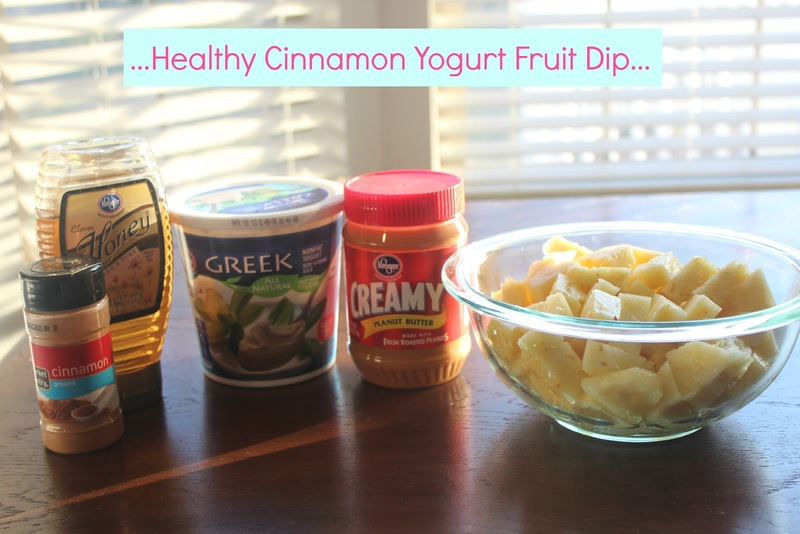 I am not a cinnamon fan, but that dip looks pretty stinkin' good! I am SO jealous you'll be in Nashville! It's my second fave city in the US (after NYC). You are going to LOVE it! That dip looks sooo good! My sister and I are starting that detox on sunday I can't wait to hear your results. That dip sounds so good! I love fruit dips! I need to make this. Like yesterday! AND... I'm so jealous of your trip to Nashville. SOOOOOO jealous. If you spot Deacon... you better be taking massive amounts of pictures!!!! I adore cinnamon anything, going to have to try this! I think I might have to try this. It has peanut butter, hello! 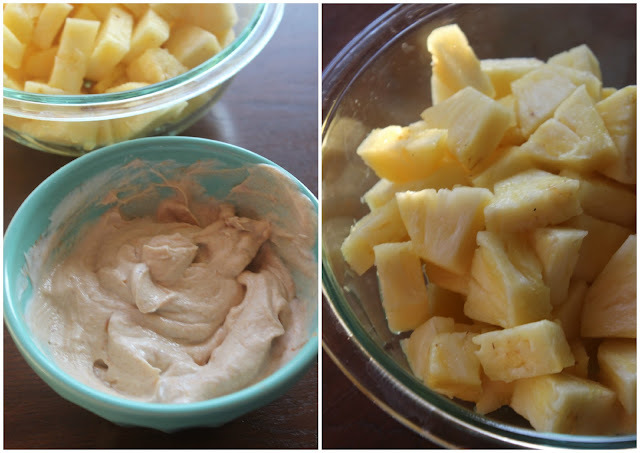 At first I saw the pineapple and was like, pineapple dip, glorious! Even though they're just "the dippers," I still think I should give it a try. I like this because you just put it in a bowl and smush it together. I mean, I could do that. haha Next week I'm planning on sticking to only fruits and salads all week so this will come in handy! I'm doing a girls trip to Nashville at the end of this month! Would love to hear where you're staying and what you end up doing! This sounds delicious and easy to make! I may have to try! This sounds sooooooooo good! Just pinned it and will be making it asap! YUMM! I just pinned this yesterday!! Gotta try it now that I know it's delicious... and, of course, I will be eating it with pineapple. My #1 fav! OH LOOKS SO GOOD! and a nice change from the salty, garlicy dips that we typically see. Looks so yummy! I love anything with cinnamon! mmmm I have to try it! This looks soooo good love! Must try. and way better than my food pics my love :-) BRAVO BRAVO!!! This is my fave dip ever and a recent find for me too! I'll have to try it with pineapple.. I usually go with the standard app and banan bc I'm not sure if I know how to cut a pineapple! Haa!! This looks delicious and the pineapple oh my gosh, I'm craving it now. The dip looks delicious!! I love greek yogurt so it seems right up my alley. I am on Day 3 of Jillian Michael's Detox right now. My stomach is not feeling it right now but hoping it goes away after lunch!! I am on Day 3 too!! Let me know how your results are! I don't mind it that much - I think because I normally drink tea and this much water per day anyways. Will keep you posted! I made this dip today and I love it! Thanks so much for posting this :) And you're right - it's great with pineapple!